Home HockeySt. Louis Blues	What can we expect from the St. Louis Blues in the Playoffs? Photo via Scott Rovak/Getty Images. What can we expect from the St. Louis Blues in the Playoffs? All 82 games have been played and the St. Louis Blues finished 49-24-9, which equals out to 107 points. They finished second in both the Central Division and Western Conference. Their first round playoff matchup for the second time in three years is the rivals next door in the Chicago Blackhawks. If you’re a diehard Blues fan, you likely don’t need a reminder of what happened two years ago. But anyways, here’s the Cliffnotes version: The Blues jumped out to a 2-0 series lead thanks to back to back overtime wins which included the longest game in Blues history. But the Hawks would take four straight after falling behind 2-0 to win the series 4-2. Here we are, in the same exact situation two years later. The Blues finished second in the central; four points ahead of the third place Blackhawks, just as they did in 2013-14 and will have home-ice advantage once again in the series. So two years later, can we expect a different result this time around? Before determining that, let’s look into the matchups of Blues/Blackhawks this season. The Blues/Blackhawks rivalry is one of the utterly most intense rivalries in the NHL and never fails to put a great game together. Photo via Dilip Vishwanat/Getty Images. The Blackhawks incredibly jumped out to a 5-2 lead after one period at home, but the Blues marched back, scoring three goals in the second period including the tying goal from David Backes. 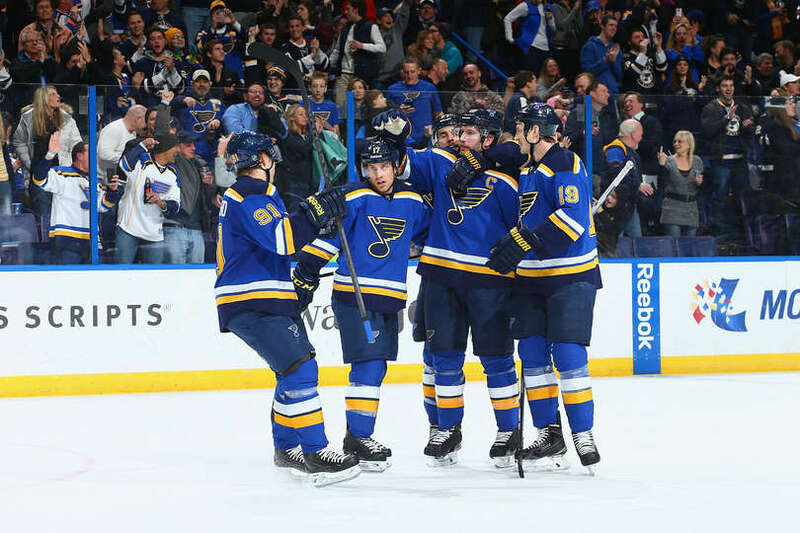 The game went to OT and Blues top scorer Vladimir Tarasenko played hero and scored the game winner to cap off an amazing comeback to win 6-5. Tarasenko had himself a game this time around, scoring two goals. But he got no help on the offensive side and the Blues fell at home, 4-2 to the Hawks. Patrick Kane got the goal considered the game winner. Two months went by before the two squads would meet again. This time, Corey Crawford stood on his head, as he stopped all 25 shots from the Blues. Artemi Panarin and Andrew Shaw added tallies for the Hawks as they beat the Blues in Chicago, 2-0. Back to Scottrade the clubs went. Andrew Ladd scored what was at the time the lone goal of the game early in the second period. But in the third period, David Backes and Troy Brouwer both scored on powerplays to put the Blues up 2-1 with under seven minutes to play. But Panarin, the outstanding Blackhawks rookie, would strike to tie the game with just over a minute to play. The game would eventually reach a shootout, where Kevin Shattenkirk would score in the sixth round and Jake Allen came up with a save (shot hit the post, still counted as a stop!) so the Blues would win it 3-2. The fifth and final regular season meeting between these two was played in Chicago. Hawks captain Jonathan Toews would score late in the second to put Chicago up one. But Tarasenko would score late in the third with the goalie pulled to even the game at 1. Then in overtime, Tarasenko would score again to win the game; this time on a beautiful setup by Stastny and Pietrangelo. Can the Blues finally get over the hump and beat the Blackhawks in the playoffs this year? Photo via Dennis Wierbicki/USA TODAY Sports. So the Blues won three of five matchups against the Hawks this season. Two of those three wins were also on the road in Chicago, where the Blues have struggled to win games the past few seasons. So with that being said, what can Blues fans expect from the Blues this postseason? Will it finally be “the year” or will it just be another early round exit? Well I don’t have an exact answer but only time will tell. Here’s what scares me. First off, the Blues are notorious for tremendous regular season success and then losing early in the playoffs. In the last full three seasons (not including 2012-13 because only 48 games were played due to near lockout), the Blues finished the regular season with over 100 points but lost three of four playoff series’ in those three seasons. Their only series win came in 2011-12 when they beat the Sharks 4-1. The playoff struggles are not all that I as a Blues fan am worried about. Yes, the Blues beat the Hawks three out of five times this season. BUT, all three wins came via overtime or the shootout. And as you all likely know, there is no three on three overtime or shootouts in the playoffs. Only regular five on five nitty gritty hockey played until someone scores. The Blues notched zero regulation wins against the Hawks opposed to the two regulation wins by the Hawks over the Blues this year. That is not a good sign for the Blues. Despite the horrendous amount of injuries the Blues suffered this season; they still finished as one of the top teams in the league. Tarasenko has blossomed into the scorer we knew he could be, totaling 40 goals, a career high. He’s the first 40-goal scorer for the Blues since Brad Boyes did it in the 2007-08 season. New faces, young and old for the Blues have also shined. That group includes outstanding rookies such as Robby Fabbri, Colton Parayko, and Joel Edmundson. Some new but older faces have also helped out, including Scottie Upshall, Troy Brouwer, and Kyle Brodziak. In my mind, this is a completely different Blues team than we’ve seen the past few seasons. Blues fans should be excited. The Blues have been playing great hockey down the stretch to end the regular season. They won 13 of 17 games from the beginning of March until the end of the regular season. There were a couple of slip-ups, but nonetheless, the Blues are playing some of their best hockey and we hope to see them continue that into the postseason. No matter the past playoff failures, Blues fans remain optimistic, as they should. Photo via Jasen Vinlove/USA TODAY Sports. I, just as you, hope to see Lord Stanley finally rose in St. Louis and go to that parade downtown. It’s what Blues fans have been waiting to see for decades. If they can continue their good play, maybe come summertime we will all be celebrating. Besides, our football team got snatched away from us so maybe the sports gods will gift us with a Stanley Cup? I sure hope so. But before we even think about that, the Blues have to beat the Blackhawks and get passed the first round. Let’s take things one at a time. Here’s to the playoffs, let’s go Blues!